Health Tips For Ramadan This article provides useful tips on how to avoid some common problems encountered in Ramadan. If followed, it would enable one to fast comfortably and enjoy fully the spiritual benefits of Ramadan. During the holy month of Ramadan, our diet should not differ very much from our normal diet and should be as simple as possible. The diet should be such that we maintain our normal weight, neither losing nor gaining. However, if one is over-weight, Ramadan is an ideal time to normalise one’s weight. Our diet should not differ very much from our normal food and should be as simple as possible. The diet should be such that we maintain our normal weight, neither losing nor gaining it. However, if one is over-weight, Ramadan is an ideal time to normalize one’s weight,” Dr. Abdulkader Ajam at the Medical Subspecialties Center, says.In view of the long hours of fasting, slow digesting foods including fiber containing foods should be consumed rather than fast-digesting foods. Slow digesting foods last up to eight hours, while fast-digesting foods last for only three to four hours. Slow digesting foods are foods that contain grains and seeds like barley, wheat oats millet, semolina, beans, lentils, whole meal, flour and unpolished rice, called carbohydrates. Fast-burning foods are those that contain sugar, white flour and other refined carbohydrates. Prior to Ramadan, a Muslim should always consult with a doctor about the safety of fasting in individual health circumstances. Even if you are generally healthy, recognize that Ramadan will take a toll. Plan your schedule and meals ahead of time in order to make sure you get the nutrients, hydration, and rest that you need. Eat suhoor just prior to dawn. Yes, it’s hard to get up at that hour, which is why it has many benefits and rewards. It will help you to wake up for the Fajr prayer. The suhoor meal is Sunnah. And this morning meal is generally recognized as the single most important meal of the day. Do not overeat, though. Focus on taking in foods that are rich in complex carbohydrates and protein, fruits or vegetables, and plenty of water. For example: an egg on whole-grain toast, a few crackers with peanut butter, some orange slices, and two glasses of water. Avoid gorging yourself when breaking the fast at sunset. 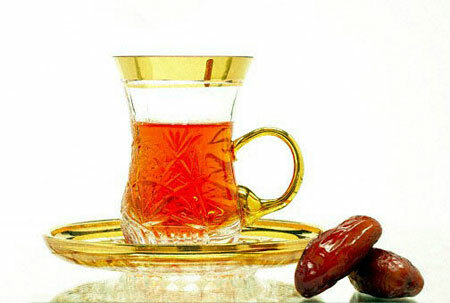 Follow the Sunnah: break your fast with dates and either milk, water, or fruit juice. After the maghrib prayer, continue with a light starter such as soup and crackers. After a long period of fasting, you need to bring your fluids and blood sugar level up without overdoing it. During the early evening (after maghrib), have a healthy and balanced dinner. Do not overeat, and be sure to drink a few more glasses of fluids. uring the evening hours, resist the temptation to drink tea, coffee, and soda. When visiting friends or family, ask for glasses of water. Serve yourself, your family, and guests a “dessert” of fresh fruit and nuts. There are lovely choices available in this season, and they are much more healthy than chocolates and candy. Sip on water throughout the evening. Aim for 8 glasses by bedtime. To help you keep track, fill and refill a water bottle with a measured amount of water, and be sure to finish it. Light exercise, such as walking for 15-20 minutes, is best done in the evening hours. Avoid fried and spicy foods as they may cause heartburn or indigestion. Speak to your doctor about an appropriate multi-vitamin. Continue to brush and floss your teeth several times a day. Next story Best Essential Tips for Your Fitness And Exercise During Ramadan..